I am currently in the throws of frantic Christmas Fair making prep (too early for the "c" word? Sorry!) and yesterday posted up a photo of a pair of fingerless gloves I made which needless to say I am keeping for myself! 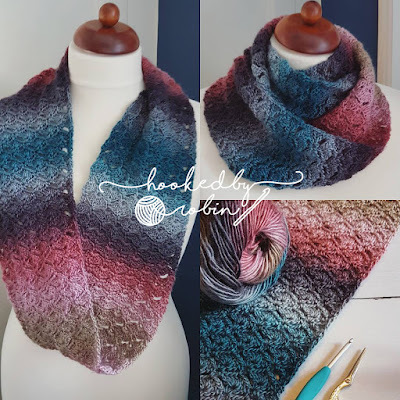 Lots of people have asked about the pattern so I thought I would quickly pop the pattern up here on my blog so you can make yourself a pair too! 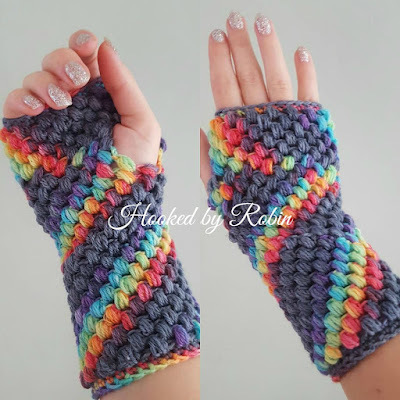 I have quite small wrists and often find that normal puff stitch gloves are too fat and bulky for my liking - I always look like I am wearing boxing gloves or the cuffs are too baggy so with that in mind, I used finer yarn which is still lovely and squishy but without the additional bulk. These gloves fit my freakishly small arms and hands perfectly but make sure you check the fit as you go - if you find the first few rows are too tight, try going up a hook size or two. 210 yards of sock yarn (or any fine dk) - (I've used hand dyed yarn from Fleabubs by Lala ) colourway "Grey Skies"
1. FSC 30, join with slip stitch to form a circle. Repeat sc row once more. I've written this in a bit of a rush so if you spot any errors please let me know!